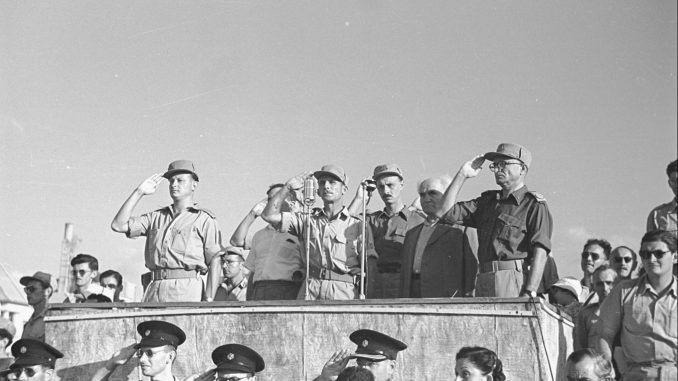 On May 1948, the Israel Defense Forces (IDF) officially began acting as Israel’s military organization, rather than the assortment of separate groups that had preceded it. 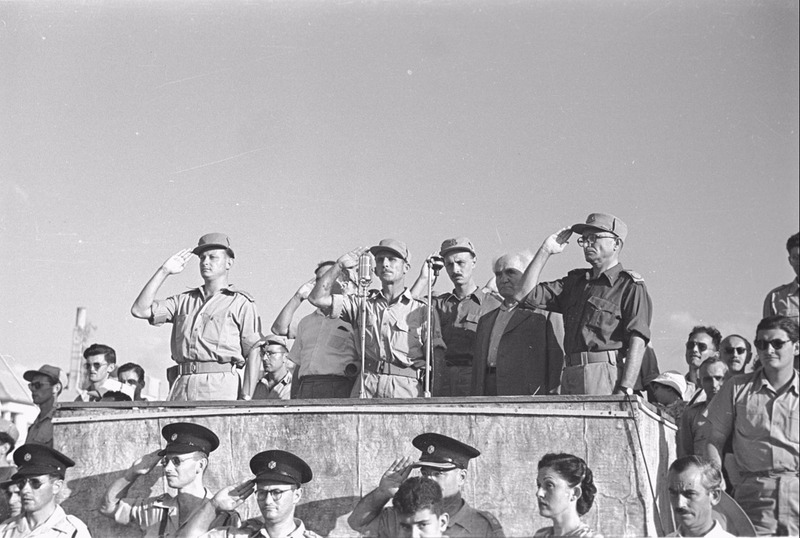 Led by the first Chief of the General Staff, Lieutenant General Yaakov Dori, the IDF took on the role of the official defender of the State of Israel and its citizens. Since its founding, the IDF has fought in seven wars, sent humanitarian delegations to more than 25 countries around the world, began a large effort to help Syrians in need, and created revolutionary technology. The IDF was established at a time when the entire country was at war for its very survival. The IDF drew its forces and weapons from the various Jewish paramilitary organizations that were active prior to the founding of the state, and began as a hastily cobbled together, ill-equipped army. By the end of the 1948 War of Independence, the IDF had defeated five invading Arab armies and became what it is today. Abbas welcomed Abu Hmeid in his personal headquarters. She is also known in the PA as “Khansa of Palestine,” – a name that refers to the woman Al-Khansa from early Islam, who sent her four sons to battle and rejoiced when they all died as Martyrs. Last Monday, Prime Minister Benjamin Netanyahu revealed a vast repository of over 100,000 documents and files that Israeli intelligence obtained from Iran’s secret nuclear archive in Tehran. The documents all attest to the Iranian regime’s clandestine plans to build nuclear weapons. One document proclaimed the ominous mission: to “design, produce and test five warheads, each with ten kiloton TNT yield for integration on a missile.” That is like five Hiroshima bombs. Under the terms of the nuclear deal, Iran committed to coming clean about all prior military nuclear activities to the International Atomic Energy Agency. The material that Israel has uncovered provides overwhelming documentary proof that Iran lied to the IAEA, deliberately concealing its true intentions and activities. As it stands, the Iranian nuclear deal does not prevent proliferation. On the contrary, the deal paves a clear path for the regime to build nuclear weapons. The deal also allows Iran to continue to develop ballistic missiles, enabling them to reach cities in Europe. The inspection mechanism is wholly inadequate. Iran has never declared its enrichment facilities voluntarily. This was true of the uranium enrichment sites revealed by another source in Natanz in 2002 and Fordow in 2009. The deal’s restrictions on Iran’s nuclear activities expire in just a few short years. Then, Iran will be free to enrich unlimited quantities of uranium, using thousands of centrifuges. This sunset clause will reward the regime for its deceit. Iran’s continued encroachment and aggression in the region, along with the major pitfalls in the 2015 agreement, and the dramatic new revelations from Iran’s nuclear archive, all attest to the folly of basing our common security upon Iranian duplicity and mendacity. Prime Minister Benjamin Netanyahu said Sunday that while Israel is not interested in a military escalation with Iran, if there has to be a fight he would prefer it be now rather than later. The comments came amid escalating tensions between Jerusalem and Tehran as the Islamic Republic has sought to expand its foothold in neighboring Syria, raising fears it could use bases for attacking Israel. His comments came a week after a strike on an Iranian base in Syria, attributed to Israel, which reportedly destroyed hundreds of surface-to-surface missiles and killed over 30 people, including many Iranian military officials. Iran denied that any of its soldiers were killed in the attacks and that any of its bases in Syria were targeted. As far as Israel is concerned, it wants to create more daylight between Assad and Russia on one hand and Iran on the other. The problem is that Iran is a key player in Syria, attending meetings frequently with Turkish and Russian officials as part of the Astana peace process. Israel is not present in those meetings and neither is the United States. So Israel can only really rely on Moscow to voice its concerns. This is the dilemma facing Jerusalem. Israel has threatened Iran and Assad with retaliation. “If Assad allows Iran to turn Syria into a military vanguard against us, to attack us from Syrian territory, he should know that would be the end of him, the end of his regime,” Energy Minister and cabinet member Yuval Steinitz told the Ynet news site Monday. There have also been more than 100 air strikes launched against Syria over the last five years according to a report last year by Amir Eshel, the former Israel Air Force commander. A third method of warning Tehran comes via media reports that reveal Iranian bases or Iranian strategy, or bring Iran’s missile threat to light. Tehran understands that these verbal messages are part of a wider strategy. Opposition forces in southern Syria arrested a number of suspected Hezbollah members in the past week, including one man who said he was awaiting orders to fire rockets at Israel, a rebel commander told The Times of Israel late Sunday night. News of the arrest raids came as defense officials warned that Iran, through its proxies, was apparently planning to carry out a missile attack against military bases in northern Israel in retaliation for a number of airstrikes against Iranian targets in Syria, which were attributed to Israel. “Israel has recently identified with certainty Iranian preparations to fire at the north,” Israel’s Channel 10 reported on Sunday. “We are not on the eve of war with Iran… but Iran is very determined to carry out an attack” to avenge the T-4 strike and the deaths of its military personnel, it said. It was unclear if the arrests of the suspected Hezbollah members in southern Syria were directly connected to the Israeli defense officials’ warnings of an impending Iranian strike. While relatively simple Grad missiles were said to be in the possession of the suspects arrested in southern Syria, Israeli defense officials said they were concerned about attacks from the longer-range, heavier and far more advanced Fateh-110 missiles. Israeli officials reacted with concern as early results in Lebanon’s first parliamentary elections in nine years indicated that the militant Iranian-backed Shiite group Hezbollah and its allies had won more than half the seats. “Hezbollah equals Lebanon,” tweeted Education Minister Naftali Bennett. Bennett said Hezbollah’s gains in Sunday’s election show that Hezbollah is now indistinguishable from the state and the two should be viewed as one. He suggested that in any future war, Israel would not distinguish between actions by the Lebanese army, viewed until now as the country’s legitimate military, and Hezbollah, which was viewed as a rogue terrorist organization. “The State of Israel will not differentiate between the sovereign State of Lebanon and Hezbollah, and will view Lebanon as responsible for any action from within its territory,” Bennett said. If the initial election results are confirmed in the final count, this spells a significant political boost for heavily armed Hezbollah, with parties and individuals aligned with it securing a simple parliamentary majority. An Israeli minister on Monday threatened that the Jewish state could kill Syrian President Bashar Assad if his regime doesn’t prevent Iranian forces from launching attacks against Israel from his territory. The warning came amid reports that Tehran is planning a revenge missile strike against Israel. Officials in the Islamic Republic have vowed to respond to several alleged Israeli attacks in Syria that targeted Iranian facilities and killed at least seven members of the Iranian Revolutionary Guard Corps. Israeli defense officials warned on Sunday that Iran was planning to retaliate by having its proxies fire missiles at military targets in northern Israel in the near future. “If Assad continues to let the Iranians operate from Syrian soil, he should know that he signed his own death warrant and that it will be his end. We will topple his regime,” Yuval Steinitz, the minister of national infrastructure, energy and water resources, told the Ynet website. “Assad cannot sit calmly in his palace and rehabilitate his regime while letting Syria be turned into a base for attacks against the State of Israel. It’s very simple,” said Steinitz who is a member of Israel’s security cabinet. British Foreign Secretary Boris Johnson appealed once more on Monday to Donald Trump not to scrap the Iran nuclear deal, saying that while the US president has a “legitimate point” over “flaws” in the accord, the global community has no better alternative. Trump has threatened to withdraw from the agreement when it comes up for renewal on May 12, demanding US allies “fix the terrible flaws” in it or he will re-impose sanctions on Iran that were eased under the historic accord. US President Donald Trump blasted former secretary of state John Kerry on Twitter Monday for interfering in the Administration’s foreign policy. “The United States does not need John Kerry’s possibly illegal Shadow Diplomacy on the very badly negotiated Iran Deal. He was the one that created this MESS in the first place!,” the president tweeted. The condemnation came days after reports emerged that Kerry met with Iranian Foreign Minister Javad Zarif two weeks ago in a bid to salvage the 2015 nuclear agreement signed between Iran and world powers. According to the Boston Globe, Kerry met Zarif at the United Nations in New York for a second meeting in as many months amid Trump’s threats to withdraw from the agreement by May 12. Former Senator Joe Lieberman criticized John Kerry on Sunday for engaging in shadow diplomacy to try to save the Iran Deal. A new Boston Globe report explained that Kerry, former secretary of state, has been using contacts he developed at the State Department to meet with foreign leaders who are favorable to the Iran Deal. Kerry’s moves fly in the face of official American foreign policy, as the Trump administration has expressed desires to back out of the deal. During an interview with Fox News’ Maria Bartiromo, Lieberman said Kerry is acting inappropriately by negotiating without being in an official government position. Lieberman noted that Kerry is being uniquely uncouth because former secretaries of state Condoleezza Rice and Hillary Clinton haven’t gone around talking to the Iranians or Europeans since leaving office. Employees at Israel’s Office of the Prime Minister found a creative use for the otherwise obsolete magnetic storage media containing Iran’s nuclear weapons development archive, some personnel report, and have taken to placing the discs under beverage holders to reduce the risk of any liquid spilled or dripped from the cups staining the surface on which they have been placed. Following Mr. Netanyahu’s live broadcast Monday evening in which he unveiled several shelves of binders and 183 CDs that Israel had obtained by clandestine means, staffers found themselves at a loss what to do about the plastic discs, which use obsolete data storage technology, until an enterprising administrative assistant suggested using them as coasters. Palestinian demonstrators continued to launch kites fitted with firebombs from the Gaza Strip into Israel on Thursday in the hopes of sparking fires. The incendiary kites caused blazes in several locations near Kibbutz Be’eri and Kibbutz Kissufim in southern Israel. A large contingent of firefighters was deployed to the area. The Israel Defense Forces is exploring more intensive measures to combat the threat, reported Kan Public Broadcasting. Among the measures being considered is the deployment of multi-rotor drones to intercept the kites before they cross into Israel. The army is also weighing the option of shooting at those who launch the kites, according to the report. Kibbutz Kissufim spokesman Benny Hasson told Israel Hayom that the incendiary kite phenomenon must be stopped. “We are calling on all Palestinians to turn the coming Friday into a date for preparations for the May 14 march with the participation of millions,” it said. 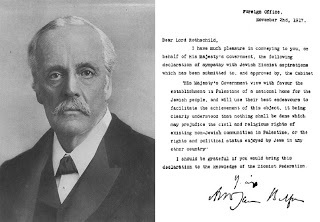 The May 14 march coincides with the opening of the U.S. Embassy in Jerusalem and is also Nakba Day, meaning the day of the catastrophe, which is marked by Arabs on the date on which the State of Israel was founded in 1948. Hot on the heels of the BBC using its cycling report on the Israeli stage of the Giro d’Italia to quote Amnesty International’s accusation that Israel is “trying to ‘sportwash’ its reputation” comes the Guardian’s equally vindictive journalism care of Martha Kelner in Jerusalem. As you can see no link, no evidence at all, just “Amnesty International suggesting”. Disgusting anti-Semitic statements from the Palestinian leadership obviously undermine the prospects for Middle East peace. When the Security Council cannot reach consensus on denouncing such actions, it only further undermines the UN’s credibility in addressing this critical issue. Defense Minister Avigdor Liberman released the calculations of how much the terrorists in several recent attacks are expected to be paid by the Palestinian Authority ahead of Monday’s scheduled first vote on a bill that would deduct the amount of funding for terrorists from the taxes and tariffs Israel collects for the PA.
Hamas has in recent months repeatedly expressed willingness through several channels to enter into talks with Israel over a long-term ceasefire in the Gaza Strip, highlighting the Palestinian terror group’s “dire” strategic situation, according to a report Monday. According to the Haaretz newspaper, in return for the years-long ceasefire, Hamas wants the agreement to include Israel significantly easing the blockade over Gaza, approving large-scale infrastructure projects and possibly a prisoner swap deal. Top Israeli security officials have recently presented the political leadership with intelligence indicating that Hamas, finding itself in an “unprecedented” crisis, is currently open to discussing issues that it had rejected in the past, Haaretz reported. It appeared Israel had not responded to Hamas’ overtures, the report said. Hamas, an Islamist terror group that seeks to destroy Israel, has made similar proposals in the past. Hamas leader Ismail Haniyeh claimed on Sunday that the terrorist group in recent years exposed “hundreds” of Israeli security and intelligence operations. His comments came after six Hamas operatives were killed in a mysterious explosion in Gaza on Saturday night. Hamas accused Israel of being responsible for the explosion, claiming it took place as the operatives were dealing with a booby-trapped Israeli intelligence device. Israeli officials believe the explosion was the result of a work accident, and that those who were killed were attempting to take apart an old missile, possibly from the 2014 counterterrorism Operation Protective Edge. Turkish President Recep Tayyip Erdogan urged the international community to show more solidarity with the Palestinian cause during a speech in Istanbul on Monday, the Anadolu Agency reported. “The indifference of the international community towards the Palestinians, who have had tens of martyrs and thousands of injured people during these [Israeli] attacks, is the sign of a future in which no society and individual will be safe,” he said. UK Foreign Secretary Boris Johnson tweeted, “Turkey is right to want to keep its borders secure”. The West gave the Turks a green light to massacre the Kurds. A new “Munich Syndrome” is now looming over the West. The Kurds, if they did not deserve a state, were at least worthy of our protection, especially after helping us to stop those who slit our throats on the boulevards of Paris. The United States has hammered another nail into the “coffin” of the 1947 UN Partition Resolution that called for the internationalization of Jerusalem. The Czech Republic, Romania, Slovakia, the Philippines, Guatemala, Honduras, Bolivia, and various other countries are considering to follow in the footsteps of the United States. The Christian evangelical sector of American voters was what finally clinched Trump’s resolve to transfer the embassy from Tel Aviv and recognize Jerusalem as the capital of Israel. The “price” Israel will pay appears to be continued restraint in construction and an occasional building freeze in Jerusalem. The embassy will open in west Jerusalem, with an “overflow” to the 1967 seam-line, which used to be no-mans The United States is effectively saying that there will be no future negotiations over west Jerusalem, but this is not the case with regard to the east. Egypt, Saudi Arabia, and Jordan will not be rushing to demonstrate against this move. The Palestinian Authority, Hamas, and Turkey, however, will attempt to provoke protests. The most likely potential for conflagration is on the Temple Mount. Israeli security forces will attempt to prevent any outbreaks of violence. Indeed, President Donald Trump has publicly implied that Prime Minister Binyamin Netanyahu will be expected to make concessions to the Palestinians as part of a year-in-the-making American peace push, with a formal plan purportedly set to be unveiled shortly after the mission’s transfer. In this respect, Liberman reportedly was presented with parts of the proposal during his trip to Washington last month, including an alleged U.S. demand that four Arab neighborhoods in the eastern section of Jerusalem—which Israel has vowed to maintain united—be ear-marked for the capital of a future Palestinian state. But the issue may anyways be moot given that Palestinian Authority President Mahmoud Abbas imposed a boycott on the White House following its recognition in December of Jerusalem as Israel’s capital, and has since repeatedly reiterated his refusal to engage in any U.S.-led peace initiative. Instead, Abbas has been lobbying foreign powers to devise an international mechanism for jump-starting negotiations, a model that Israel disapproves of. Officials in Jerusalem believe President Donald Trump will most likely not make it to Israel for the unveiling of the new US embassy in Jerusalem, slated for May 14th, coinciding with the 70th anniversary of Israel’s establishment according to the Gregorian calendar. A senior Israeli Foreign Minister official informed Arutz Sheva that with just seven days left before the embassy opening ceremony, the White House has not notified Israel of any plans by the president to visit. While the president has hinted in the past that he may indeed attend the opening ceremony for the new embassy, which he ordered as part of the recognition of Jerusalem as Israel’s capital last December, the significant security precautions required for the president to visit likely preclude a surprise trip with only a few days’ notification. 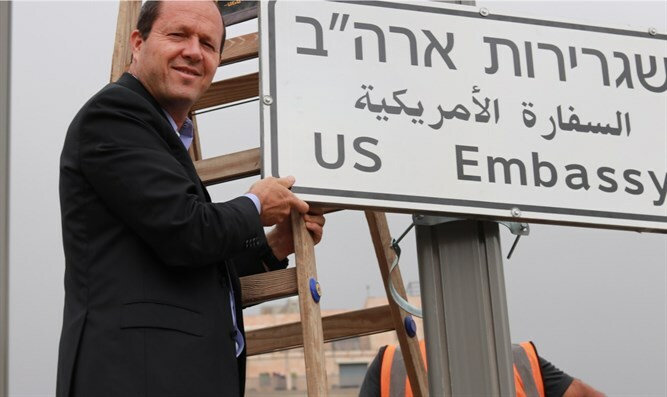 Jerusalem Mayor Nir Barkat on Monday hung a road sign directing traffic to the US Embassy. “This is an historic event, and I thank US President Donald Trump for it. The Palestinian Authority has called on foreign diplomats and religious leaders to boycott the opening ceremony of the US embassy in Jerusalem, scheduled to take place next Monday in Jerusalem’s Arnona neighborhood. Senior Palestinian Authority spokesman and Secretary-General of the Palestine Liberation Organization’s Executive Committee Saeb Erekat claimed that the relocation of America’s embassy from Tel Aviv to Jerusalem violated international law, and flouted United Nations Security Council decisions. “By recognizing Jerusalem as Israel’s capital and moving its embassy thereto, the Trump administration is violating its obligations under international law, including UNSCR 478, and the U.S. own commitments towards the peace process,” Erekat said, according to the PLO mouthpiece WAFA. Calling President Trump’s December 6th declaration recognizing Jerusalem as Israel’s capital and announcing plans to relocate the embassy “international anarchy”, Erekat lobbied religious leaders and representatives of foreign governments not to attend the unveiling ceremony. The Israeli embassy in Egypt’s planned 70th Independence Day gala is arousing controversy, with attempts made to cancel the event and antisemitism in the press, Hebrew newspaper Yediot Aharonot reported on Sunday. According to the report, the event will be the first of its kind in a decade. It is planned to include a large gala at the Nile Ritz-Carlton in Cairo with top Israeli chef Shaul Ben Aderet providing the food. What followed is described as a “diplomatic drama.” Israeli government and military officials reportedly pressured the Egyptian government to reverse the cancellation. The Egyptians ultimately acquiesced and the celebration will take place as planned. A Saudi body seems to have backtracked on a new initiative calling to end prayer-time store closures and gender segregation in public places – potentially divisive reforms for the deeply conservative kingdom. Arabic-language newspaper Okaz reported that the Quality of Life program to improve life in Saudi Arabia had cited both practices as requiring “immediate change” in order to increase the public’s participation in its activities and boost investor confidence. The article, published on Friday, was later removed. Reuters saw a copy of the document it cited, but a different version posted on an official website did not mention gender segregation or store closures among needed reforms. No timeframe was specified. Loai Bafaqeeh, chief executive of the Quality of Life program, refused to comment on the apparent discrepancy. “We are looking into all things that relate to the citizen and resident, including things that involve improving the quality of life, such as families entering sports stadiums and women driving,” he told Reuters by phone on Saturday. Researchers of the distant past expressed their thrill today that the Republic of Syria will soon consist of little more than destroyed buildings, abandoned cities, and the evidence of a once-proud civilization, which represent the profession’s bread and butter. Academics and field personnel specializing in the ancient Middle East confessed excitement at a weekend event for members of the profession to help keep apprised of developments in scholarship and field study in the arena, where they learned that at the current rate of destruction, the Syrian Civil War will reduce 95% of the country to rubble by the year 2030, providing archaeologists with all the ruins they need for the foreseeable future. The Association of Scientists and Scholars of Archaeology and Debris (ASSAD) convened in the Syrian capital this past Saturday and Sunday for a close-up look at the pace of ruins production in the failed Levantine state, following years of anticipation that the warring factions in the conflict – the Syrian regime, Russia, Iran, Iran-backed Shiite militias such as Hezbollah, the Islamic State, the Nusra Front, the Free Syrian Army, Turkish militants, Kurdish fighters, and others – would yield new stocks of cataclysm-produced materials that the researchers spend their careers examining.